A Snake River rafting trip begins at Hells Canyon Dam and flows through the deepest canyon in North America. The canyon formed more than a million years ago when water draining from Lake Idaho rapidly cut through rock, creating walls towering more than a mile above the river. While the Snake River is considered Class III-IV, most of its rapids occur in the first 30 miles. This affords an excellent adrenaline surge at the start and a relaxing scenic journey towards the middle. The beginning stretches lead rafters over rapids such as Wild Sheep and Granite Creek– comparable to the bigger rapids of the Colorado River in the Grand Canyon. River runners can raft the first 34 miles down to Pittsburgh Landing for an exciting three-day trip. Those interested in a longer excursion with ample time to explore the canyon may continue down to Heller Bar for a total of 82 miles in six days. Designated “Wild and Scenic,” the Snake River flows through Hells Canyon National Recreation Area and the Wallowa-Whitman National Forest during its entire course. 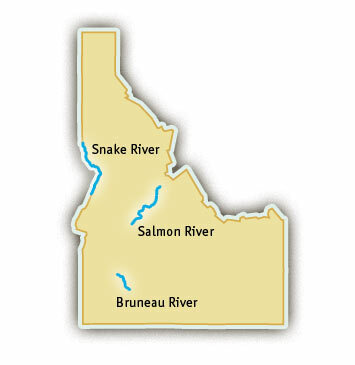 Toward the end of the journey, the Salmon River joins the Snake, uniting the two largest rivers in Idaho. Snake River rafters often see bighorn sheep, mountain goats and black bear. But wildlife isn’t the only riverside attraction– historic homesteads as well as ancient Native American ruins can be explored. Petroglyphs carved by the Nez Perce Indians decorate the canyon walls at Pittsburgh Landing. The Snake River is dam-controlled, so there is plenty of water in the river for rafting throughout the spring and summer. Water temperatures are warm, so even in the spring, the Snake is a great place for family rafting trips.